I’ve managed to put some time aside for one of life’s simple pleasures; Food gardening. 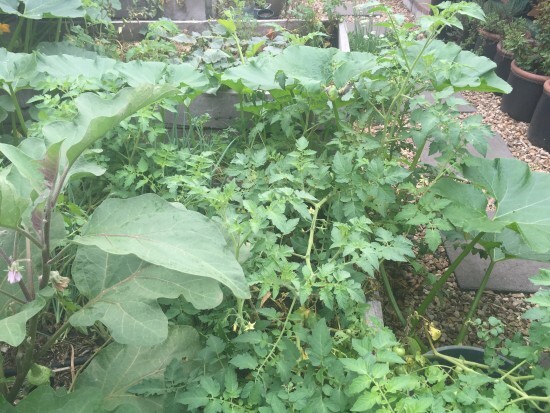 I also thought it was about time I gave you an Autumn garden update about the state of my food growing efforts. So here is a series of photos that I took on Monday to show you what is growing and what we are harvesting in the Autumn garden. We’ve had very hot weather during March, but starting to get a little rain now after a very dry summer. All three of my rainwater were running low as I had to water every day to keep it all alive. Thankfully we’ve had about 15mm of rain in the last couple of weeks to fill them half way. With climate records broken in January and February, who knows what the future will bring? The two VegTrug that I fixed with shade cloth are allowing the soil within them to stay moist, which helps the pick-again lettuce to grow strong and not bolt to seed too early. I find that this method of mostly shade for lettuce really slows down their natural tendency to bolt and turn bitter. These plants only receive about 3 hours direct sunlight a day, but are doing well. We pick the leaves every other day. 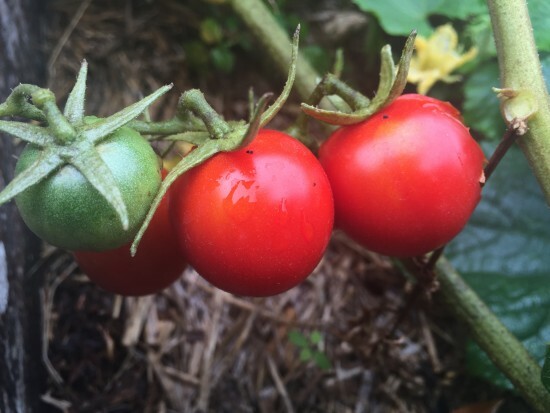 One of my favourite varieties of tomato are Tommy Toe, which is an heirloom variety. Bigger than a cherry tomatoes and more flavoursome. 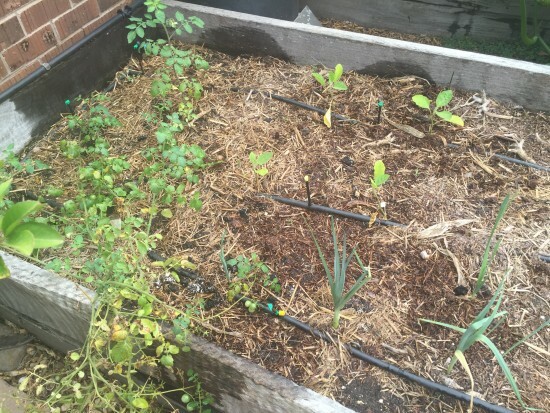 I planted four seedlings in early January (succession planting) to ensure a continued crop until mid Autumn. 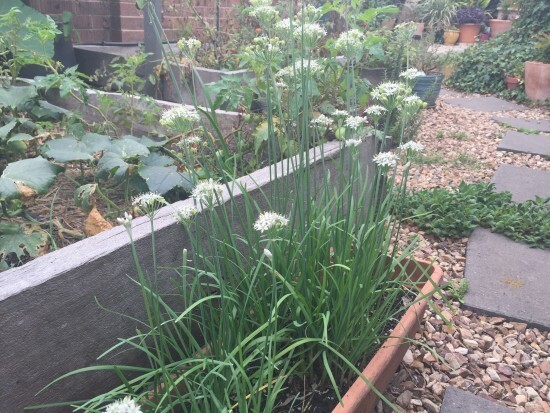 The Garlic chives, which are a perennial here, are going through their yearly flowering. I’ve had them in this pot for about five years and still growing well. 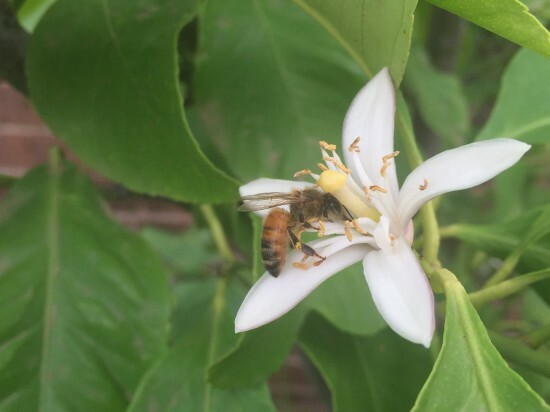 Because the citrus trees are confused by this very warm start to Autumn, they are beginning to flower again. Luckily there are still lots of bees around willing to pollinate them for me. This variety of tomato is a weed around here. The birds spread the seeds everywhere and each year they grow in the most amazing places. These should ripen in the next week or two. Thankfully they are growing in a bed that they were planted in two years ago and these plants are nice and healthy and getting lots of water. 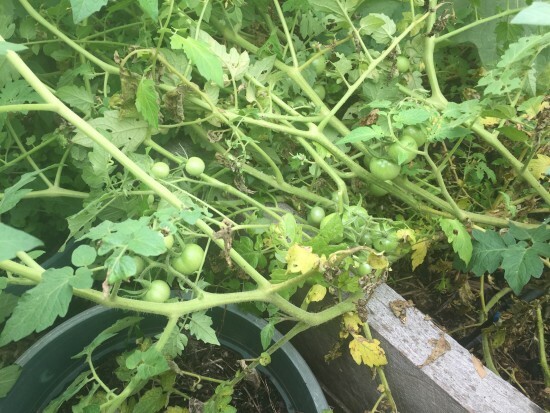 Growing tomatoes in the same soil year after year makes them prone to diseases like blight. This bed is a bit of a mixed bag. 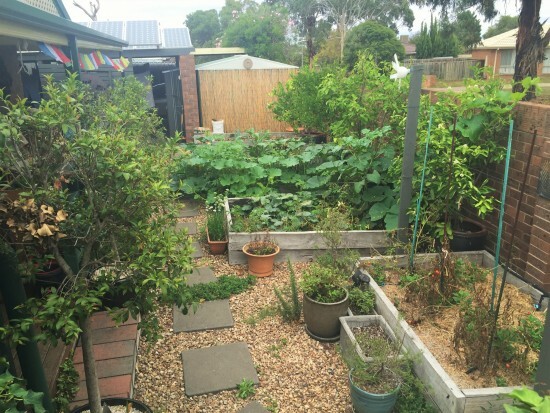 I planted a few Eggplants (Aubergines), and spring onions bunches in early January, but also got some tomato varieties and massive Australian Butter Pumpkin! More about the pumpkin later. Even if I didn’t like eggplants in Indian cuisine, I would still grow them just for their beautiful flowers. I love the colour and the little spikes around the top of each one. 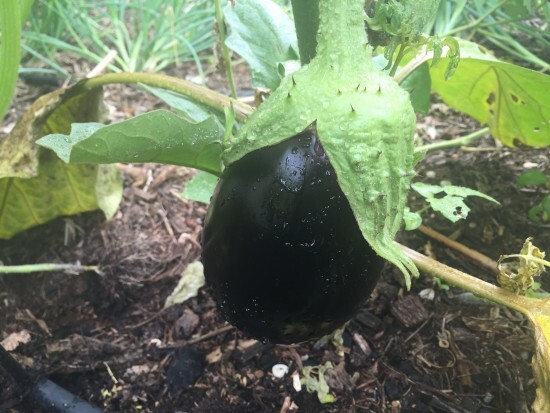 Thankfully though, I do get some amazing eggplants growing in the well composted soil that I maintain in each garden bed. This one is nearly ready for harvest, and there are a few smaller ones on the other two plants. Might even have enough to make my famous Brinjal Pickle! This bed is a mixed bag as I previously mentioned. 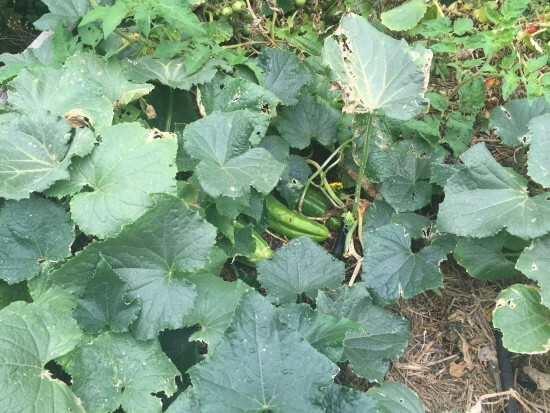 The pumpkin has all but taken over the entire yard, but I have been pinching off the runners so that the laterals grow and produce more pumpkins. We should be harvesting them in mid April. This is bed #2 in which I have some Long Finger Eggplants. 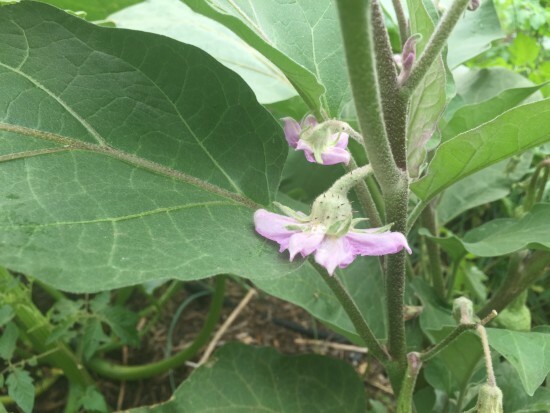 Hopefully there will be enough warm days for the eggplants to grow to harvest, but not to worry if they don’t. I have plenty of the larger eggplants, so these were just contingency. Next to the Long Finger Eggplants I have Leeks growing. These are last years leeks that didn’t grow so well during our dry winter last year. I let them die back and they are now growing strong. I am very pleased that we may get a crop of Leeks so Kim can make some Anglesey Eggs. I have started off one of the winter beds early. 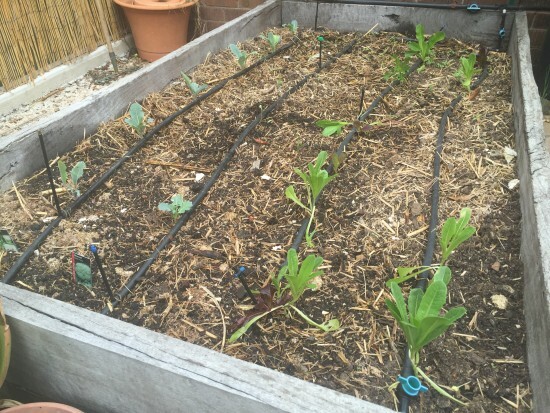 I grew some Cauliflower seedlings and took a punt that they would survive the early autumn. So far so good, and once the lettuce next to them are used up, I will plant a few cabbages in this bed as well. 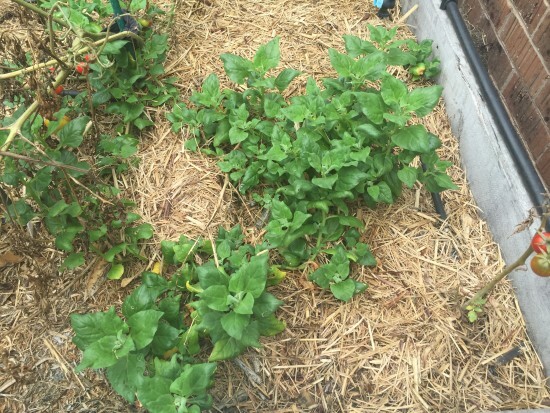 I also planted some Cherry Belle Radishes in between the rows as they are quick-growing and it would be nice to have a bit of crunch and hotness to accompany our regular salads. 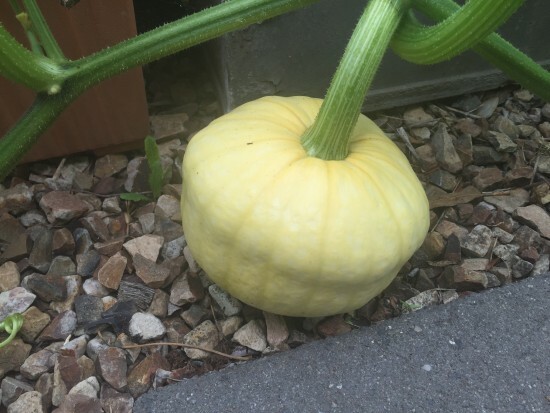 This is one of a few pumpkins that set from the single pumpkin plant that is taking over my garden. The tip for this runner was pinched off weeks ago and the pumpkin is loving the extra nutrients. I will place a piece of cardboard under the pumpkin soon to prevent the rocks from denting the skin. 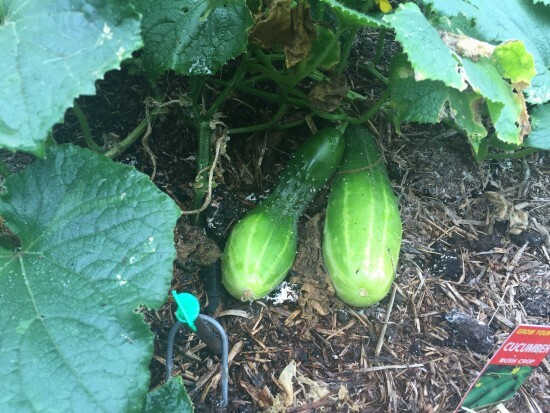 We’ve been harvesting cucumbers for about a month and still not tired of them yet. There is always a ripe one lurking under the leaves, and you just have to keep an eye on this patch to ensure that no monsters grow. If they do grow to large, the native birds make good work of disposing of them for me. I planted 8 seedlings this year, which seemed to be just enough to keep up with all the salads we’ve been eating. And lastly, here is one of the many NZ Spinach (aka Warragul Greens) that are self seeding around here. Just about every bed has one or two of these growing, and they keep us in leafy spinach greens during most of the warmer months. You just have to blanch them for a minute or two before eating them like normal English spinach. So that is the current state of the Autumn garden. 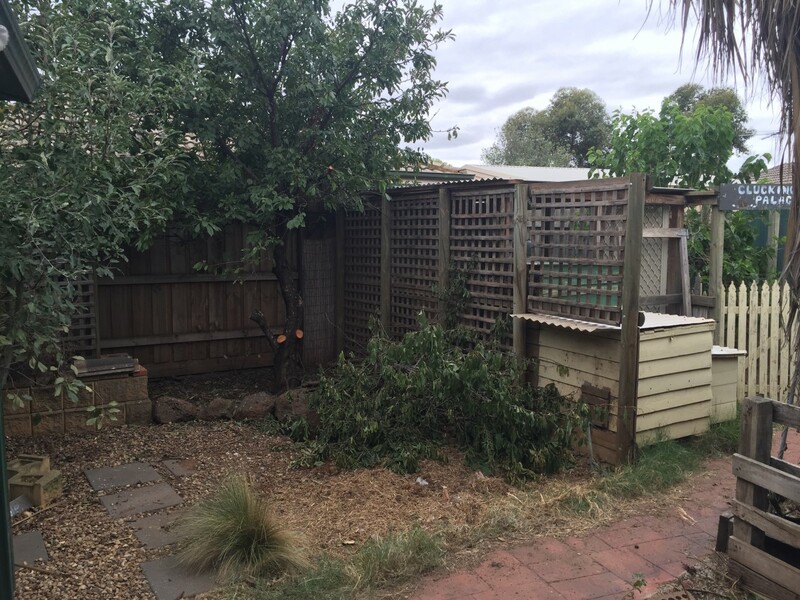 In the next few weeks I will remove the tomato plants and put in some Broad Beans and Garlic. 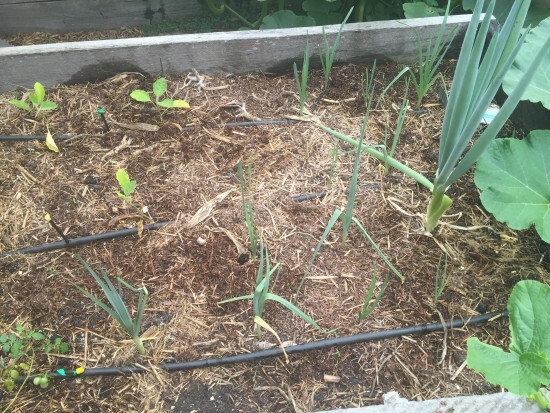 I will plant some onions in the front garden beds as well as a few more Brassica like Sprouting Broccoli and Cabbages. 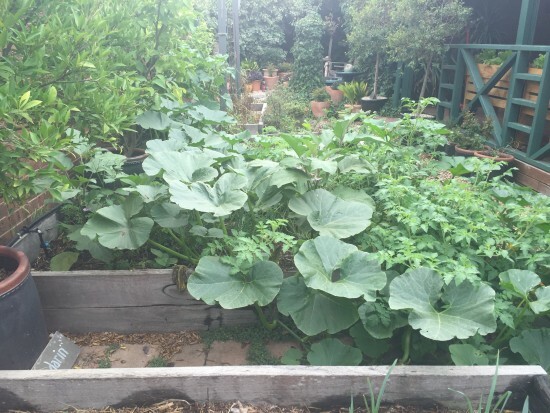 How is your food garden growing? 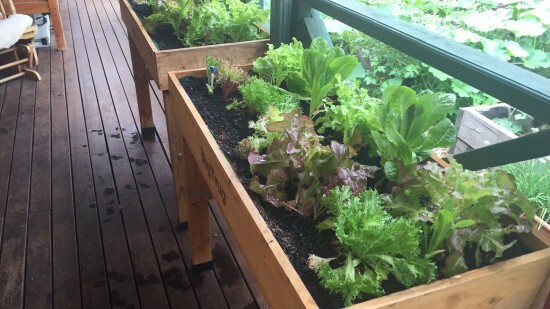 Are you getting enough rain to keep them growing well? We’ve been eating simple fare of late, all unprocessed, wholesome, and mostly home grown dinners. Due to the crazy heat we’re having in March (which is actually supposed to be autumn), we have been serving salads from the newly repaired Vegtrug, with organic or free-range meats. However, last night was a special treat. During a lovely day trip showing our friend Cheryl around, we stopped off at the Pastry King Bakery in Daylesford and picked up some delicious wholemeal rolls. We then swung by Ballan to visit Jessie (aka Rabid Little Hippy) to drop off some wooden picture frames and to collect a bag of tomatoes. As we were travelling home to Melton, we stopped off in Bacchus Marsh (Fruits of Life) to collect some BioDynamic milk ( I can feel a cheese coming on). I had an abundance of home-grown Basil, so I picked a bunch and with Cheryl’s assistance began to prepare dinner. 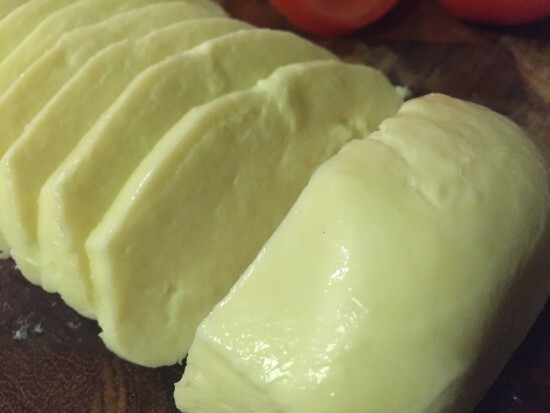 Firstly I made quick Mozzarella with the milk. 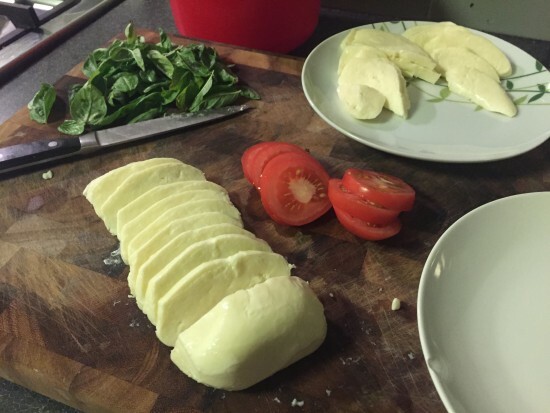 If you want to learn how to make that, then check out my Quick Mozzarella video tutorial. Then we sliced up the ripest tomatoes, washed all the basil leaves, and cut the bread into slices. The Mozzarella was left to chill in the fridge for a few hours before I cut it up. This was the basis of our dinner. All this was served with the wholemeal bread, basil infused extra virgin olive oil, and freshly cracked black pepper and sea salt. Oh, and with a little drizzle of balsamic vinegar on top to add a little sharpness. It was delicious. Cheryl had never tasted such amazing flavours, especially heirloom tomatoes and fresh Mozzarella. No pictures of the final serving, because we ate it so fast! We also washed it down with a bottle or two of delicious cider from Daylesford Cider Company. 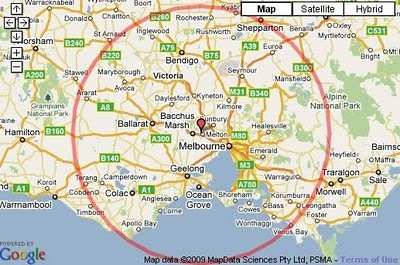 And just to think that all these ingredients came from within 160 km (100 miles) of where we live! Not only does locally grown produce taste great, but it also has a lot less food miles, which means less carbon emissions.